LIKE TO PARTY? Come party with us! Join our volunteer team,helping to set up and host children’s birthday parties at the Museum. Help us provide our members and visitors the BEST BIRTHDAY PARTY EVER! 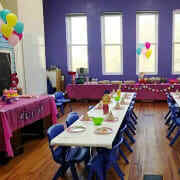 We are looking for energetic people to help set up our Party room, assist birthday parents to bring food and party supplies into the Museum, help serve food and birthday cake, help clean up room afterward and also help put museum toys and props in their proper places during and after party. Parties are scheduled for mornings and afternoons on Saturdays, when we're also open to the public, and private parties on Sundays. We are looking for people who can come on a regular schedule on selected Saturdays and/or be "on call" for Sunday parties. Saturday or Sunday availability. Minimum 5 month commitment required.